The origins of the Khalwati order are obscure, but most attribute Umar al-Khalwati as its founder, or the "first pir". However, Umar- Khalwati was considered a mysterious man who did very little to spread the order. 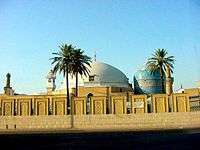 Shaykh Yahya Shirvani was considered "the second pir" that was responsible for the spread of the Khalwati order. Yahya Shirvani lived during a time of great political instability in the wake of the Mongol invasion. After the Mongol invasions, Turkish nomads began to gather into urban centers of the Islamic world. All these cities had Sufi shaykhs performing miracles for the nomads. Thus, these Turkish nomads were easily converted to mystical Islam when the Sufi shaykhs promised them union with Allah. Yahya Shirvani entered Baku at this time of religious fervor and political instability, and he was able to start a movement. Yahya Shirvani was able to gather ten thousand people to his movement. Yahya had many popular, charismatic disciples to spread the order, including Pir Ilyas. The situation varies from region to region. In 1945, the government in Albania recognized the principal tariqas as independent religious communities, but this came to an end after the Albanian Cultural Revolution in 1967. In 1939 there were twenty-five Khalwatiyya tekkes in Macedonia and Kosovo. In 1925 the orders were abolished in Turkey and all tekkes and zawiyas were closed and their possessions confiscated by the government, and there is no data available on the status of the Khalwatiyya. In Egypt there are still many active branches of the Khalwatiyya. The Khalwati order had many tekkes in Istanbul, the most famous being the Jerrahi, Ussaki, Sunbuli, Ramazaniyye and Nasuhi. Although the Sufi orders are now abolished in the Republic of Turkey, the above are almost all now mosques and/or places of visitation by Muslims for prayer. 1 2 3 4 5 6 7 8 9 10 11 12 13 14 15 Keddie, Nikki R. (1972). Scholars, Saints, and Sufis. Los Angeles: University of California Press. p. 401. 1 2 3 4 5 6 7 De Jong, Frederick (2000). Sufi Orders in Ottoman and Post- Ottoman Egypt and the Middle East. Istanbul: Isis Press. p. 274. ISBN 975-428-178-5. 1 2 3 Trimingham, J. Spencer (1998). The Sufi Orders in Islam. New York: Oxford University Press. p. 333. ISBN 0-19-512058-2. 1 2 3 4 5 B. G. (1972). "A Short History of the Khalwati Order of Dervishes". In Nikki R. Keddie. Scholars, Saints, and Sufis: Muslim Religious Institutions in the Middle East Since 1500. University of California Press. pp. 275–306. ISBN 978-0-520-02027-6. ↑ John J. Curry, The Transformation of Muslim Mystical Thought in the Ottoman Empire: The Rise of the Halveti Order, 1350-1650 , ISBN 978-0-7486-3923-6. ↑ Knysh, Alexander (2000). Islamic Mysticism: A Short History. Leiden: Brill. pp. 265–266. ISBN 90-04-10717-7. ↑ Schimmel, Annemarie (1975). Mystical Dimensions of Islam. Chapel Hill, North Carolina: The University of North Carolina Press. ISBN 978-0-8078-1223-5. ↑ Frederick De Jong (1987). Nehemiah Levtzion and John O. Voll, ed. Eighteenth-Century Renewal and Reform in Islam. Syracuse: Syracuse University Press. pp. 117–132. ISBN 0-8156-2402-6. ↑ Knysh, Alexander (2000). Islamic Mysticism: A Short History. Leiden: Brill. pp. 270–271. ISBN 90-04-10717-7. ↑ Julia Day Howell and Martin van Bruinessen (2007). Martin van Bruinessen and Julia Day Howell, ed. Sufism and the 'Modern' in Islam. New York: I.B. Tauris & Co Ltd. pp. 12–13. ISBN 978-1-85043-854-0. ↑ Knysh, Alexander (2000). Islamic Mysticism: A Short History. Leiden: Brill. p. 268. ISBN 90-04-10717-7. ↑ Knysh, Alexander (2000). Islamic Mysticism: A Short History. Leiden: Brill. p. 269. ISBN 90-04-10717-7. ↑ Geels, Antoon (1996). "A Note on the Psychology of Dhikr: The Halveti-Jerrahi Order of Dervishes in Istanbul". The International Journal for the Psychology of Religion. 6 (4): 229–251. doi:10.1207/s15327582ijpr0604_1. ↑ Schimmel, Annemarie (1975). Mystical Dimensions of Islam. Chapel Hill: The University of North Carolina Press. p. 172. ISBN 0-8078-1271-4. ↑ Knysh, Alexander (2000). Islamic Mysticism: A Short History. Leiden: Brill. p. 270. ISBN 90-04-10717-7.